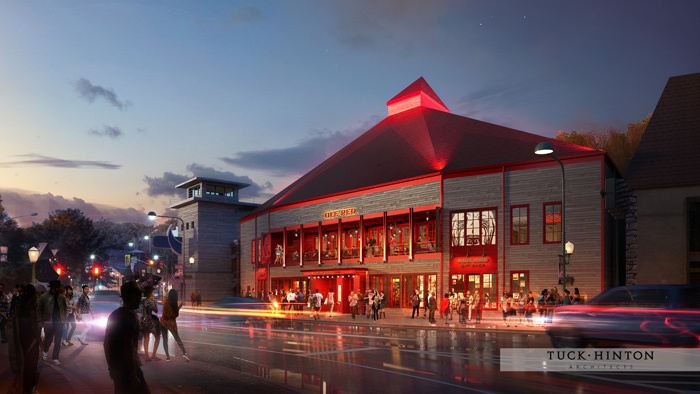 Opening soon is Blake Shelton's Ole Red Gatlinburg a $9 million, multi-level attraction with a ton of fun to offer visitors to the Smokies. Following the success of Ole Red's two other locations in Blakes hometown of Tishomingo, OK and the capitol of country music, Nashville, TN, this multi-purpose venue is coming to the Smokies in March. This 16,000 square foot entertainment venue will offer guests a two-story bar and restaurant, retail area, performance space, and dance floor for a whole lot of fun in the mountains. Echoing the fun, irreverent feel of Shelton's breakout hit "Ol' Red," fans of country music will enjoy kickin' back with friends and enjoy good food and good music in a laid back atmosphere. Here's what to expect at this exciting attraction opening soon. Redneck Nachos- A country twist on a bar classic. Kettle chips topped with smoked chicken, Rotel cheese sauce, pickled jalapeños, avocado, sour cream, Ole Red's special barbecue sauce, and green onions. Southern Tater Tot Poutine- A down-home twist on the Canadian classic. Tater tots topped with pulled pork, sawmill gravy, white cheddar curds, green onion, fried egg, and Ole Red's Hot Sauce. Nacho Average Vegan Burger- This vegan burger is topped with nacho cheese, avocado smash, lettuce, tomato, onion, and pickled jalepeños. Champagne of Fried Chicken- Brined in Miller High Life beer, fried, and served with black pepper gravy. You can get your chicken Nashville Hot Chicken Style or Not. This delectable dish comes served in a champagne bucket. Lucky Charms Banana Pudding - Classic vanilla wafer banana pudding topped with chantilly cream and Lucky Charms cereal. 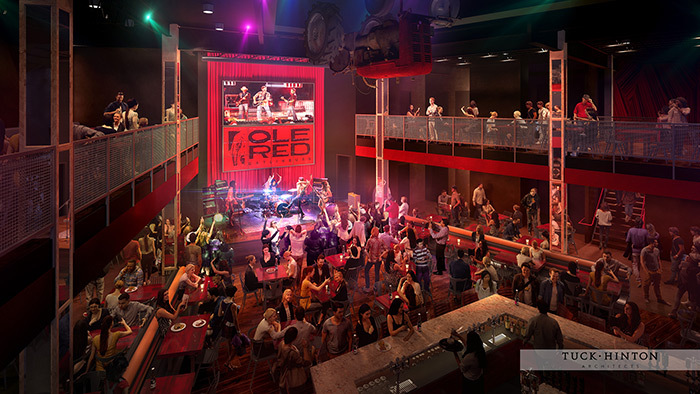 We're excited to see what custom cocktails and other delicious entrees the Ole Red restaurant and bar will feature. Of course, Ole Red is much more than a new restaurant in Gatlinburg. Visitors will also be able to enjoy live music at the venue. From up-and-coming local talent to surprise star appearances, we're eagerly anticipating the announcement of the line-up. What's certain is guest are sure to enjoy an awesome performance with concert-level production and sound capabilities and LED screens throughout the space so that everyone can enjoy the act. The dance floor in front of the stage invites you to dance to the music and enjoy a carefree time in the Smokies. Want to stay close to all the fun and exciting attractions like Black Shelton's Ole Red Gatlinburg Restaurant and Venue? Book a Gatlinburg cabin rental and enjoy a convenient location near all the Smokies have to offer on your vacation to remember. Stay tuned for more details about this exciting new attraction and more with our Smoky Mountain travel blog!